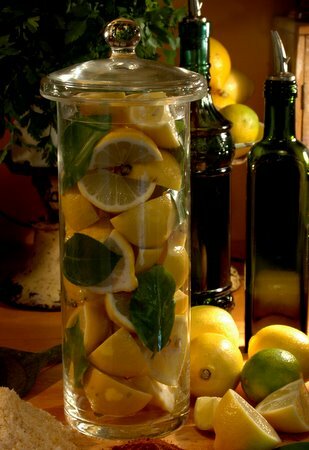 A wonderful way to use lemons in winter…in soups, chicken tagines, lamb tagines, stews, ragouts, oven-bakes dishes, sambals. I also use the skin, finely chopped in salads. 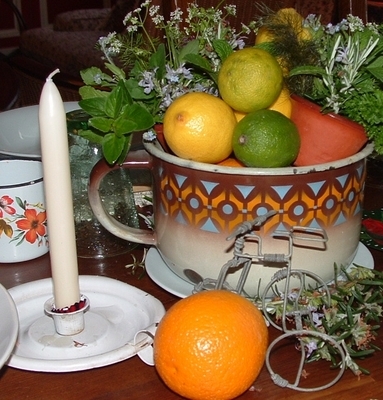 Not too mention how beautiful it looks in the pantry, or on a buffet or kitchen dresser..
Wash the lemons well under running water and cut them into quarters. Mix the salt, sugar, chilli powder and turmeric together and roll the quarters in the mixture until well covered. Layer the lemon quarters is a sterilized jar and sprinkle each layer liberally with the sugar mixture. Add the lemon leaves and fill the jar with the lemon quarters and sugar mixture until full. Store in a cool and dark place, turning the jar upside down every day. Store for about a month before using. The lemon juice and sugar mixture will eventually form a brine. If preferred, you can omit the sugar and spices, keep the lemons whole, prick them with a fork and layer the whole lemons with the coarse salt. Recipe adapted from Rainbow Cuisine by Lannice Snyman. This is an entry for A spoonful of Christmas, hosted by Zlamushka from Zlamushka’s spicy kitchen. love your presentation though. that is a beautiful tall jar. the kind u love to display on your kitchen counter top ! This is one of those recipes I have been meaning to try for ages. This winter, I’m doing it. Lovely pic. I’ve been dying to try these… thanks for the recipe. The skin is also great if chopped into small cubes and mixed with olives, a little olive oil and thyme. Ronelle, you have a particularly fine talent for arranging ingredients under glass. I love sweet and/or salty preserved produce. This, like your jarred quince, makes an outstanding presentation.